The successful promotion of a company’s product line depends on effective marketing and presentation. It is vital for a product to be advertised in such a way that grabs the audience’s attention and also creates brand recall among customers. Most companies are looking for an approach that will give them the best return on their investment. While there are many methods of advertising, Point of Purchase (or POP) displays are an effective and low cost method that can be used as one component of an overall marketing strategy. 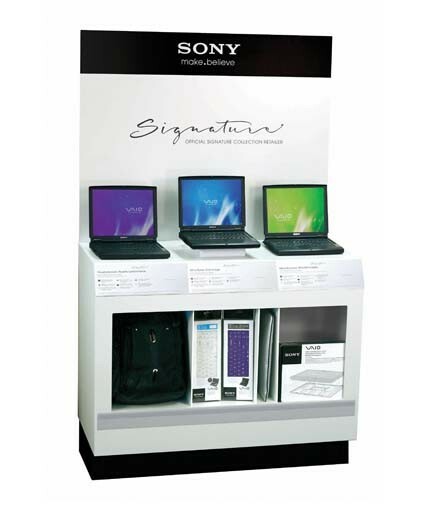 Effective point of sale signage is a critical element of any POP display program. Point-of-purchase displays come in variety of forms, including backlit signboards, stand-a-lone showcases, or counter top displays right at the cash register. An effective display will have the brand name prominently featured. POP fixtures and retail store displays should be colorful and attractive to consumers. The goal is to draw the customer’s attention to the display to entice them to buy your product. They should always be targeted to the demographic you are trying to reach. Furthermore, they should also make a statement about your company and be consistent with your brand image, as it may be the only impression the customer gets of your company. Be visible! Use bright, contrasting colors, themes and fonts. This is not a time to be conservative or choose uniformity. Signs must reach out and grab the consumer. Use eye-catching graphics and simple messages. Get creative! The more fun, the better. Provide incentives to purchase. Include coupons in your display, either for the product you are selling or for one of your complementary products. You can also use your display graphics as an opportunity to up-sell customers by displaying information about an upgrade or an entire product line. Show the product “in action” either with photographs of your target audience using the product, info-graphics on how to use the product, or videos that demonstrate the product and emphasize its features and benefits. Create interaction by providing more information. Include QR codes in signs that direct consumers to FAQs, or include interactive touch screen devices on the display that enable consumers to learn more about your product. Make sure your signs are seen! Placement is critically important. Graphics should be at or near eye level to ensure you catch the attention of customers who are making their purchase decisions. If you want to increase the chance your logo, brand, and message are seen, don’t settle for sub-optimal graphics placement. Think about the best way to drive impulse sales by creating attractive, appealing signage offering promotions. A good graphics strategy will not only result in increased impulse purchases, but it will generate a return visit to your display to see what the next exciting promotion will be. If your quantities are not high enough to use traditional four-color processed graphics (usually in the thousands of pieces), there are so many high-tech image output options available today to create practical and stunning display graphics. These include digitally printed graphics, either on flexible, pressure-sensitive substrates that can be die-cut or graphics printed directly on almost any rigid panel which can then be CNC routed to become the structure of a POP display. These options create so many possibilities for designers. And still viable too is the screen print method for a crisp graphical look. Screen printing is a very affordable option if you have the right quantities (usually at least 100-200 units) for the number of colors needed. An optimized PDF from Acrobat Pro (preferred). 225-300PPI Rasterized resolution at 100% scale. A compressed file in a .zip or .rar format. PMS colors so the printer can ensure the best PMS color match when printing digitally. Depending on the color management system, PMS colors may fall outside of the capabilities of a digital printer’s color gamut. So now, crank up that imagination and knock your customers’ socks off!